The National Stadium or Stadion Narodowy in Polish, is the home ground of Poland’s national football team having being constructed for the 2012 Euros which the country co-hosted with Ukraine. Poland’s National Stadium was constructed over a three year period beginning in early 2008 and finishing in November 2011. The inaugural match wasn’t to be held until the following year on 29th February 2012 between the Polish National Team and Portugal. Resulting in a 0-0 draw, the wait for the first match was perhaps not worth it for those fans in attendance. Designed for Euro 2012 which Poland co-hosted with neighbouring Ukraine, the stadium reportedly cost half a billion euros making it the most expensive of all grounds to be purpose built for the tournament. The façade consists of a series of aluminium panels which mimic the colours of the Polish national flag, and inside the ground also adheres to this colour scheme with the plastic seating also in red and white. One of the most notable features of the design is the retractable PVC roof which unfolds from a nested spire which is suspended above the pitch’s centre spot. Inspired by a similar cabling system present in Frankfurt’s Commerzbank-Arena, and Vancouver’s 2010 renovated BC Place, the architects Gerkan, Marg and Partners have developed a reputation in recent years for lending a hand to some of the most architecturally impressive stadiums in the world. During Euro 2012 the stadium hosted three other group matches, a quarter final and semifinal between Germany and Italy. After forfeiting any claim to the final after hosting the opening ceremony and match, it seemed only fair that Ukraine’s National Stadium, would hold the last and most important match of the tournament. The record attendance was set two years later on 30th August 2014 when Poland took on Serbia. The stadium is set to host the 2014/2015 Europa League Final which will once again shine the spotlight on Poland’s beautiful national Stadium. The two teams in the final will either be Napoli or Sevilla and one of either Fiorentina or Dnipro Dnipropetrovsk depending on who wins the semi-final matches. Pictures of each stand are coming soon. One thing for sure is that Polish Football Fans are fantastic, and can be relied upon to create a lively atmosphere on matchdays. To acquire tickets for International matches as an away fan you should consult your local football association. They are usually allocated a certain amount of tickets per match depending on how large the travelling contingent is expected to be. There is a superb range of sports bars and Irish Pubs located within Warsaw city centre however there aren’t really any situated within the immediate environs of the ground. It’s probably recommended to drink before hopping on the metro/train although you can always get a pint once you are at the stadium. Five minutes south east of the ground on Paryska Road there are some a reasonable number of dining options including independently run restaurants and a KFC for those who fancy fast food. At the stadium there is the Geleria Cafe which serves is suitable if you get to the ground early, otherwise you’re free enjoy the standard range of food on sale inside the concourses. As there is no club who takes up permanent residency there there isn’t a club shop located at the stadium. You can usually purchase merchandise of the Polish national team on International matchdays however. English speaking guided tours of the stadium are available seven days a week on a first-come first-served basis, and can be booked on the day via the main reception desk or ticket office. Both of these points are located in the main stand near gate number 1. A closer look at the mechanism which is responsible for opening and closing the roof of the stadium. Tickets are sold by the event organiser and not the national stadium itself, and thus the official website doesn’t have any booking facilities to purchase tickets online. You can use it however to see a list of forthcoming events, and to find out where you may be able to purchases tickets. Football fans may wish to note that the only domestic match the stadium routinely hosts each season is the Polish SuperCup. Poland’s National stadium is located in the Praga-Południe district of Warsaw which is centrally located on the eastern bank of the Vistula. The exteior of the iconic red and white stadium as seen from aleja Józefa Poniatowskiego which runs south of the ground. There appears to be an underground car park available to use on matchdays for a small fee which can be accessed via entrance point 6. This parking page on the website shows you the location of the official car parks. The national stadium is served by its very own station known as Warszawa Stadion which is located 650m north of the stadium. Accessible via both the S1 and S2 lines, the journey from central Warsaw takes approximately five minutes, and then five minutes more by foot once you have arrived. During rush hour and matchdays, trains reportedly depart every 4 minutes which means around 26,000 people can reach the stadium every hour which sounds efficient enough considering the official capacity of 58,826. 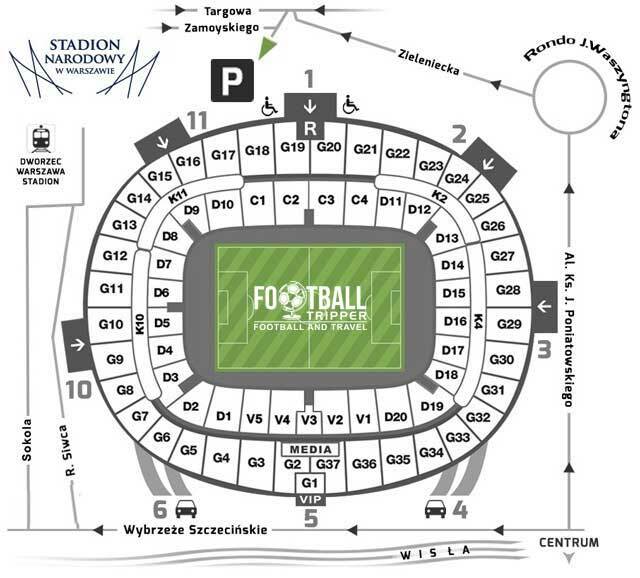 The closest station to the stadium is Stadion Narodowy Metro Station which is located on line 2. It first opened on 8th March 2015 and is one of the sleekest ways to get to the stadium. It is located 2 minutes further north of the Warszawa Stadion station, and still leaves a walking distance of less than 10 minutes. The view of the unmistakable red and silver exterior of Poland’s national stdium from the Wyjscie station. Th stadium can be reached from various stops around the city including bus routes 117, 158, 507, 517, 521. Warsaw has two airports which you may or may not use based on where you are flying from. Chopin Airport or Okecie as it is sometimes known is the larger of the two and is 10 km away, whereas Modlin Airport is slightly further (35 km) and has traditionally been the flight hub for low-cost carriers. The two closest hotels to the stadium are probably Dedek Park and Hotel Hetman which are five and ten minutes north of the ground respectively. As you’re in one of the most popular tourist city’s in Europe however you might as well catch the train back to the centre and find something more acccessible. Safe names include Radisson Blu, and Warsaw Marriott, with the Golden Tulip located very close to the main railway station of Warsaw.